In the neighborhood of Green Acres, the country living character of the community is certainly what the residents like the most. Tucked in between the Barron Park neighborhood and Los Altos, the cozy neighborhood of Green Acres consists of 3 main areas – Green Acres I, Green Acres II, and Palo Alto Orchards. Once a tract housing development, Green Acres still has many houses with modest sizes (1600 to 1800 sq ft), and many traditional ranch-style homes or American Bungalows. Most of Green Acres were orchards at one point, and the neighborhood kept a lot trees along its streets, making it easy to understand where the “Green” part of its name comes from. Two parks, on Arastradero Road and Maybell Avenue, are within walking distance, and Adobe Creek serves as the dividing line between Green Acres and Los Altos. 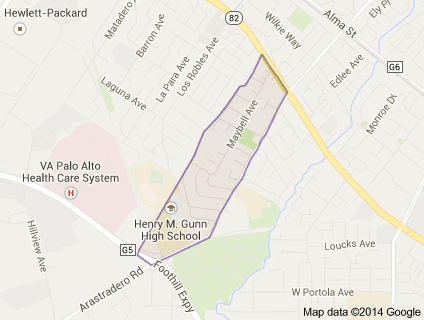 Because it’s a bit further from Stanford University, Green Acres has fewer students than other nearby neighborhoods. But many schools, both private and public, are within walking distance – Terman Middle School, Gunn High School… - making Green Acres the ideal neighborhood for families looking for a quiet and safe neighborhood for their kids to grow up in. Kids and parents often walk or bike to school, and crossing guards help everyone safely cross Arastradero Road during school hours. Many families come here for the school district, and stay because they love the small neighborhood and community feel. The Green Acres Improvement Association has been meeting four times a year since 1952 and organizes get-togethers for the neighbors, such as an ice-cream social in the summer, a pot-luck in the fall or a Christmas party in December.